I would have to say that these are probably one of my most favorite things in the world to eat! And they are extremely healthy. Basically they are a fresh salad in a rice wrap. They are definitely worth the time assembling them. Cynthia, Bob and I all cut and assembled these in no time flat. You can make them a day ahead if you like. The problem is that they are so delicious you tend to eat them once you roll them, but that's ok...no one will be watching you right? Be sure to cut all of the veges and mango before you assemble. Once this done, things will go fast. Having a 2-3 others help you is useful! --Especially people who are good at rolling burritos. It’s pretty similar. Soak one rice paper in lukewarm water until pliable, about 5 minutes. Work with only 1 paper at a time and blot dry before assembling. I put a frying pan on the stove and heat water and place the rice paper in the heated water until pliable. 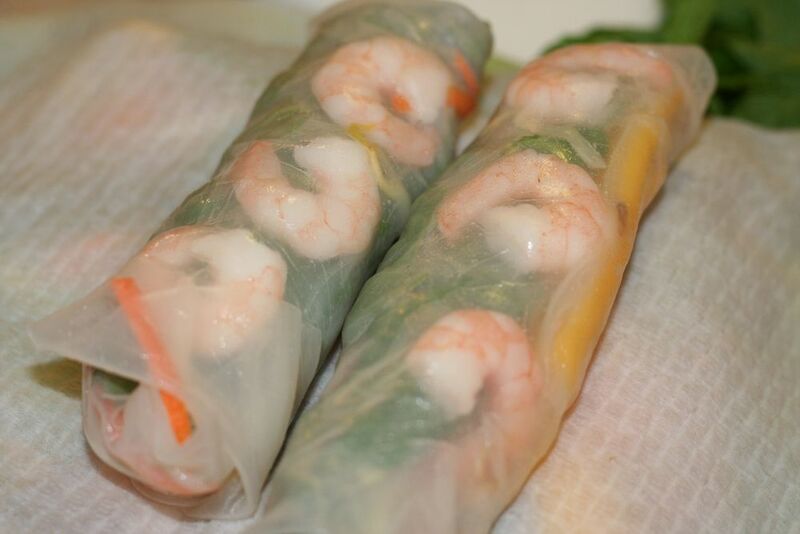 You put the rice paper in the water only once you are ready to roll another one. To assemble: Place 1 soaked rice paper on a clean flexible cutting mat or large plate, leaving 1-inch of the rice paper uncovered on the edge closest to you. Place 1 lettuce leaf (or a few spinach leaves) on the sheet. Top with a portion of the cucumbers, carrots, shrimp, mango, chives, sprout, scallions, and mint leaves. (You can really add whatever you like here-but to me the mint and mango is the kicker to having fantastic summer rolls in my opinion). Fold the paper once over the filling, starting from the bottom, then fold in the sides and continue rolling tightly to the end. Keep rolls covered with a damp paper towel and cover with saran wrap. I usually make enough until my fillings run out. Sometimes this is 1 to 1.5 packages of rice paper. Serve with Spicy Peanut Sauce. In a medium saucepan, heat the oil over medium heat. Add the curry paste and stir-fry until fragrant, about 2 minutes. Add the fish sauce and continue to stir for about 1 minute. Add the peanuts and stir, roasting until two shades darker but not burned, 8 to 10 minutes. Add the sugar and continue to cook until the sugar is dissolved and starts to caramelize, 1 to 2 minutes. Add the coconut milk, chicken broth, tamarind concentrate, and hoisin sauce. 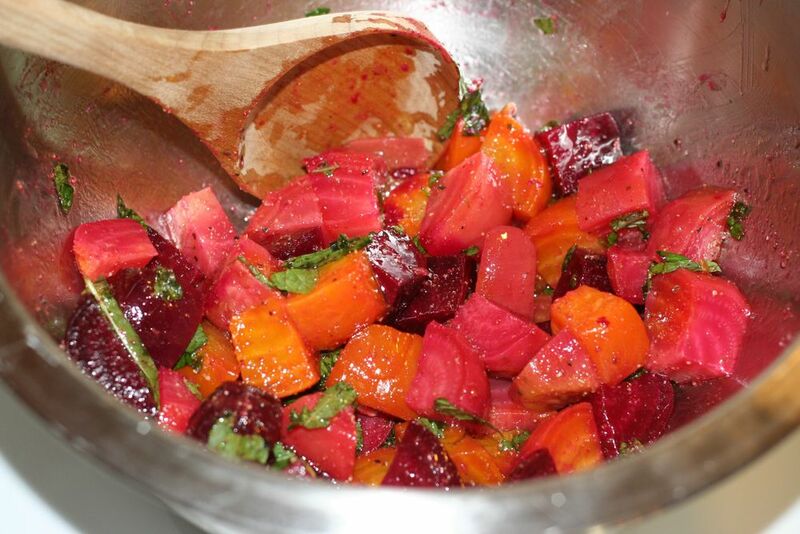 Reduce the heat to low and simmer the sauce until slightly thickened, about 20 to 30 minutes. The natural oils from the peanuts should have surfaced at this point. Once the sauce has reduced by about 1/3, turn off the heat and add the Thai basil and cilantro. Cover and let cool. Store in the refrigerator for up to 3 days. Words cannot describe how much I love cole slaw! Ask my husband and he could tell you stories about me and cole slaw. But these stories will remain a secret for now. I am a bit of a cole slaw snob too. If cole slaw gets served to me as a side...I usually try it first and either give the restaurant and thumbs up or down based on this alone. I cannot tell you how much bad cole slaw there is in this world. In Wisconsin, fish on fridays is a bit of a religion. But to me the kicker is the slaw. Without good slaw the fish fry just doesn't add up for me. I just wish more people spent more time making better slaw. The world would be a better place if they did. This is a take on the regular cabbage cole slaw. I hate mayo (with a passion) so all of my cole slaw recipes usually have vinegar of some sort in them. I love asian flavors so usually my slaws are made this way. I think the broccoli slaw that is prepackaged is great. It's usually crunchier than regular cabbage slaw which I really like. The addition of mint and cilantro is the kicker. I can eat a whole bowl of this! I hope you enjoy it! Combine all ingredients except for the peanuts and dressing. When ready to serve, thoroughly toss with the dressing and scatter the ground peanuts over the entire dish. Sometimes letting the broccoli sit in the dressing for a while enhances the flavor..but no more than a few hours as it might get soggy.